Due to the shortages of Dowsil 12577 and 12620, there is a demand for a viable alternative conformal coating. The reduced supply is expected to continue for the next 8-10 months. And because of these shortages, customers are experiencing outages, short shipments, and increasing lead times. That's why we developed Konform SR-X conformal coating as a great replacement for Dowsil 1-2577 and other silicone coatings using an alternate base resin and formula. There is a window of opportunity to where PCB assemblers are very motivated to find a replacement for these legacy coatings, which could represent millions of dollars in new sales. Konform SR-X isn't just a "good enough" substitute, in many ways it outperforms the Dowsil coatings. 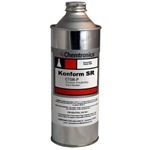 Konform SR-X is also available in high viscosity, Konform SR-X950 for users who require it. Konform SR-X is a one-part, clear conformal coating with moisture, corrosion and abrasion resistance. Low VOC coating for maximum flexibility and protection from extreme temperatures, harsh environments, and vibration damage. Silicone conformal coatings are the most universal coating, offering protection for a wide variety of environments. This coating offers resilient, mechanical stress-reducing protection. Utilizing a moisture/humidity-based curing mechanism, this coating cures quickly at ambient conditions. Take a look at the chart below to see how Konform SR-X compares to Dowsil 1-2577 and our other conformal coating formulas. Be sure to contact us if you have any questions about this new conformal coating. We'd be happy to speak with you.